Today, many campers do not simply “camp” anymore, they still would like to have some of the comfort experienced at home in their camp. Providing electricity is a great option to make your campers feel right at home. However, campground projects can be expensive, so Morrill Electric is committed to saving you thousands of dollars with our factory direct pipes, wires, and transformers. We will even design the electrical distribution system in your campground for free. It is part of our commitment to deliver the best customer service possible. Morrill Electric is here to provide professional electrical solutions for campgrounds and other outdoor areas. Whether you need electrical installations for bathrooms and shower houses or RV electrical plug outlets, we’re here to provide you with a free estimate and timely installations. We provide installations and replacement services during the spring, summer and fall, so don’t hesitate to contact us to make sure your campground is ready for opening day this spring as well as ensure the system is all set and prepared for the winter months. Our recent campground project at Danforth Bay Camping Resort in Freedom, NH have helped us earn a reputation as a reliable and safe electrical company. 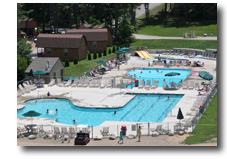 We installed and wired their expansion called “The Bluffs” built for senior citizens that include over 200 sites, a large club house, pools, (12) 400amp-2 meter services and (6) 200amp-2 meter. Contact Morrill Electric now at 978-388-1522 for a free estimate on your next campground project.